Welcome to our live blog from the College Station City Council’s workshop and regular meetings on Thursday, Jan. 10. It’s not the official minutes. The College Station City Council gathers Thursday at city hall for its workshop (5 p.m.) and regular (6 p.m.) meetings. The College Station City Council gathers Monday at city hall for its workshop (4 p.m.) and regular (6 p.m.) meetings. Canvassing of Election Returns: The council will canvass returns and declare results from the Nov. 6 election for places 4 and 6 on the city council and five city charter amendments. Vessali Takes Oath of Office: Place 4 Councilwoman-elect Elianor Vessali will take the oath of office, followed by a short reception bidding farewell to outgoing Councilman Barry Moore. Place 6 will be decided in a Dec. 11 run-off between Elizabeth Cunha and Dennis Maloney. Open Storage: On the consent agenda is an amendment that eliminates the open storage of commodities for sale, lease or inventory in areas zoned rural and allows the storage of materials for private use that are not visible from the public right-of-way. Accessory Living Quarters: After a public hearing, the council will consider amending the city’s Unified Development Ordinance regarding off-street parking and the rental of accessory living quarters. Single-Family Height Protection: After a public hearing, the council will consider amending the city’s Unified Development Ordinance regarding single-family height protection and building height. The meetings can be watched live on Suddenlink Channel 19 or online. Please note that we won’t be doing a live blog from this meeting. (L-R): Bob Brick, Linda Harvell, Jerome Rektorik, Karl Mooney (mayor), John Nichols, Barry Moore, James Benham. Welcome to our live blog from the College Station City Council’s workshop and regular meetings on Thursday, Aug. 23. It’s not the official minutes. The workshop has started. No action was taken out of executive session. The consensus of the council was to close antiquated Thomas Pool at the end of the summer and explore new amenities in Thomas Park. Council also requested a survey of residents to determine their preferences. The 39-year-old facility loses 200,000 gallons of water per month because of cracks in the shell, drains, and joints. It was also found to be noncompliant with state and local codes. Repairs were estimated at $685,000. The council discussed exclusive bike facilities such as Austin’s Veloway. The consensus was that projects identified in the Bicycle, Pedestrian and Greenways Master Plan were a higher priority. Some citizens have expressed interest in a safe place to ride recreational bikes away from vehicles, pedestrians, and pets. Four people spoke during Hear Visitors when citizens might address the council on any item that doesn’t appear on the posted agenda. James Benham recognized Army Pvt. Ruben Estrella-Soto as part of the Fallen Heroes Memorial program. The 18-year-old El Paso native died March 23, 2003, when his convoy was ambushed in Iraq. Jonathan Coopersmith spoke about local bicycle issues. Janice Sahm and Joel Cantrell spoke against the closing of Thomas Pool. An inter-local agreement with Brazos County and the City of Bryan to apply and accept a U.S. Department of Justice 2018 Justice Assistance Grant. A revised agreement to sell reclaimed water to Pebble Creek Country Club. An annual purchase contract not to exceed $120,000 with Bound Tree Medical for EMS supplies. After a public hearing, the council unanimously voted to approve minor corrections to the city’s Unified Development Ordinance such as text omissions, references, and other clerical errors. After a public hearing, the council unanimously voted to approve a request to change the zoning from Rural and General Suburban to General Commercial for about 17 acres along Old Wellborn Road southeast of the General Parkway-Holleman Drive South intersection. After a public hearing, the council unanimously voted to approve a request to change the land use designation from Suburban Commercial to Urban for about 11 acres on the west side of Turkey Creek Road about 500 feet south of HSC Parkway. After a public hearing, the council voted 6-0-1 to approve a request to change the zoning from Rural to Multi-Family for about 11 acres on the west side of Turkey Creek Road about 500 feet south of HSC Parkway. Councilman Barry Moore abstained. Mayor Mooney adjourned the meeting. The council meets again on Thursday, Sept. 13. (Standing, L-R): Bob Brick, Jerome Rektorik, John Nichols, James Benham. (Sitting, L-R): Linda Harvell, Karl Mooney (mayor), Barry Moore. Welcome to our live blog from the College Station City Council’s workshop and regular meetings on Thursday, Feb. 22. It’s not the official minutes. Hanson South Water Sale: As part of tonight’s consent agenda, the council will consider a contract with Burleson Water Resources to pump water from the existing ponds on the Hanson South property for hydraulic fracturing of oil wells. BWR will bear the costs for equipment and pipelines and will pay the city 10 cents a barrel, which is the industry standard rate. The city will have a contractual guarantee for at least $150,000 of revenue for the Water Fund during the first 12 months of the two-year contract. BWR must use an above-ground pipeline to move the water. Prudent safety and environmental protection provisions are also included in the contract. The council discussed the city’s policies, procedures, and legal requirements for spending public funds. The council discussed the city’s progress on updating its 10-year Comprehensive Plan. The council discussed why Lick Creek Park and Veterans Park have not been included in the city’s count of community park acreage. It also considered the effects of that acreage exclusion to the Parks and Recreation Master Plan and parkland dedication fees. James Benham recognized Army Lt. Benjamin Britt as part of the Fallen Heroes Memorial program. The 24-year-old Wheeler native died Dec. 22, 2005, when an improvised explosive device detonated near his position during a dismounted patrol in Baghdad, Iraq. Jerome Rektorik recognized the College Station Police Department for its quick action last weekend in apprehending the A&M Consolidated High School student who made a terroristic threat on social media. Robert Rose voiced his support for the bicycle parking requirements that will be discussed later tonight. Richard Woodward of the College Station Association of Neighborhoods spoke against the council making zoning changes over the objections of neighborhood residents. Awarded an $83,000 contract to Ramtech Building Systems for a 24-by-56-foot modular office building at the Utility Service Center. A $468,000 contract with CRT Construction for the development of Reatta Meadows Park and upgrades at Crescent Pointe Park. Reissued a not-to-exceed $1.5 million contract with H&B Construction for annual electric system construction and maintenance labor. Ratified a contract for Burleson Water Resources to purchase pond water from city water wellfield property called Hanson South. The city’s participation in inter-local cooperative purchasing programs with Choice Partners National Purchasing Cooperative and GoodBuy Purchasing Cooperative. Amended the building use agreement with the Arts Council of Brazos, changing the terms to month-to-month for the building at 2275 Dartmouth Dr.
After a public hearing, the council voted 6-1 to approve a request to changing the zoning from General Suburban to Suburban Commercial on about 1.9 acres at 2201 Raintree Drive, which was revised from General Suburban to General Commercial. The change will allow for development. After a public hearing, the council voted 4-3 to approve a request to change the land use designation from Restricted Suburban to General Commercial for about 29 acres south of the Rock Prairie Road-Fitch Parkway intersection. Mayor Karl Mooney, Councilman Bob Brick, and Councilwoman Linda Harvell voted against the motion. The change will allow for development. One person spoke during the public hearing. After a public hearing, the council voted unanimously to amend the city’s Code of Ordinances related to bicycle parking requirements. An earlier motion to change additional language in the existing ordinance failed, 5-2. Councilmen Barry Moore and Jerome Rektorik voted for the motion. Amendments to Section 2.2 “Planning and Zoning Commission” and Section 2.8 “Administrator” include the removal of authority in reference to the color palette. Amendments to Section 5.8 “Design Districts” and Section 5.10 “Overlay Districts” include the removal of references to the color palette. Amendments to Section 7.10 “Non-Residential Architectural Standards” include removal of references to the color palette, removal of mechanical screening requirement for all zoning districts other than Suburban Commercial and Wellborn Commercial, and add architectural relief options. Mayor Mooney adjourned the meeting. 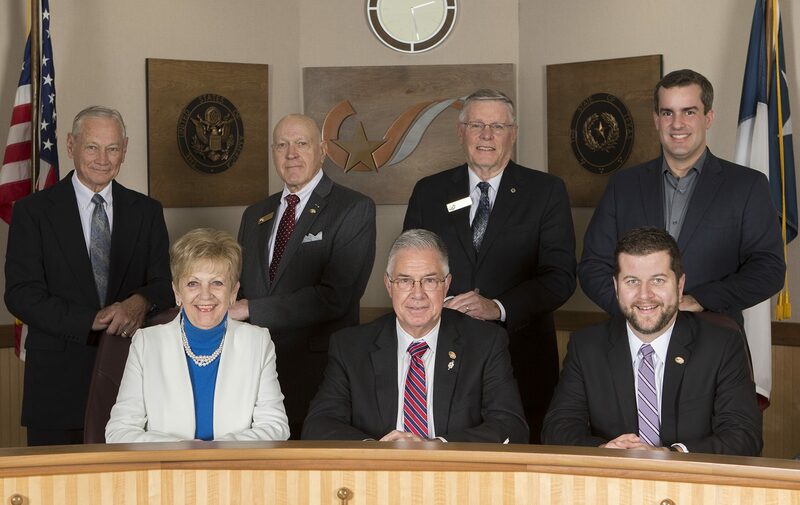 The council meets again on Monday, March 5. Comp Plan 10-Year Update: In the workshop, the council will hear a presentation on the 10-year update of the city’s Comprehensive Plan. Reatta Meadows Park: As part of the consent agenda, the council will consider a $467,980 contract for the development of Reatta Meadows Park, along with upgrades to Crescent Pointe Park. Rezoning at Raintree and Highway 6: After a public hearing, the council will consider a request to change the zoning from General Suburban to General Commercial for about two acres on Raintree Drive north of the State Highway 6 intersection. The change would allow for development. Land Use at Rock Prairie and Fitch: After a public hearing, the council will consider a request to change the land use designation from Restricted Suburban to General Commercial for about 29 acres south of the Rock Prairie Road-Fitch Parkway intersection. The change would allow for development. Non-Residential Architectural Standards: After a public hearing, the council will consider easing the city’s non-residential architectural standards related to screening, architectural features, and the color palette. The meetings can be watched live on Suddenlink Channel 19 or online. We’ll post a detailed live blog post on this site.